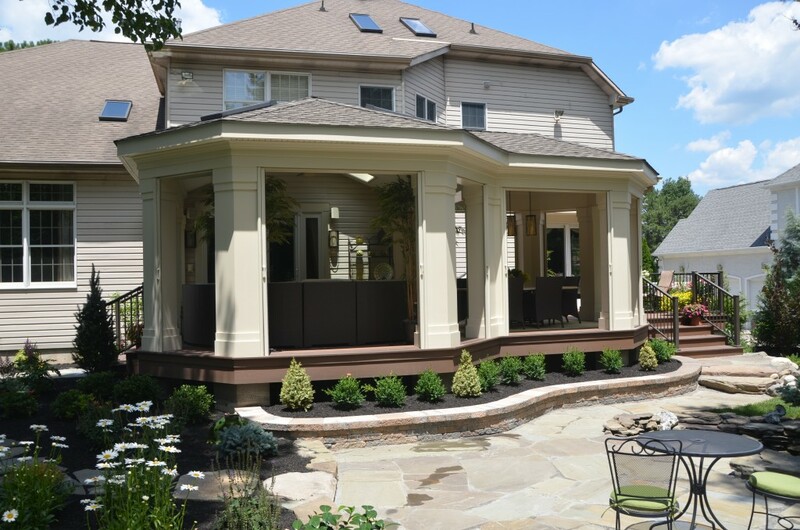 This screen porch project is the replacement and enlargement of an existing composite surfaced deck and awning system with 682 square feet of Azek™, Arbor Morado decking, 447 square feet of which is covered and enclosed with Phantom™ screening units. Calling this a mere screen porch does not do this project justice. The elegant design is by Jill Traister of East Coast Designs of Hammonton, NJ, and the structural design was by Holiday Architects, Inc. of Medford NJ. The geometry is based on juxtaposed octagonal sections, and the roof is constructed to allow for a fully hipped interior ceiling, covered with Mastic’s Pro-bead™ solid, vinyl soffiting inside and vented outside. The decking is mitered to follow the geometric motif of the entire structure, including each stair tread, and each miter is rounded-over for effect. The perimeter band board is covered with Azek’s Acacia trim board to achieve a subtle contrast to the decking. All of the structural columns are wrapped in white Azek, and finished with crown and base trim of the same material. The roofing material is GAF’s Timberline to match the roof of the existing home. Four Velux™ Skylights are installed in the new roof to provide ample natural light into the enclosed areas. The roll-away Phantom screens at each opening give the feeling of open space without the invasion of summer’s insects. WAC’s, invisiLED®, Palette lighting is installed to the interior ceiling perimeter to provide soft up-lighting and obscured behind the interior Azek crown molding. WAC, LED lighting is also used for the more direct 6” recessed lights in the ceiling field. Low-voltage lighting is also added to all stair risers for remarkable nighttime effect. Approximately 30 linear feet of coordinating bronze, aluminum railings are installed where needed for safety and code compliance. The new screen porch is highly functional for the client’s family and is a spectacular example of an artful melding of form and function. NLR is grateful to the family for the opportunity to produce this project.